The Zibelemärit is a traditional folk festival held on the fourth Monday of every November. Farmers from the surrounding areas head to the Swiss capital with more than 50 metric tons of onions and garlic in artistically woven braids. When the air in Bern’s lanes is filled with the scent of onion tarts and Glühwein, the traditional Zibelemärit has returned to the Swiss capital. Even in the early hours of the morning, the Old Town is filled with thousands of visitors as they enjoy this farmers’ market and folk festival in one. Once a year, many Bern locals rise from their beds far earlier than usual: Although the Zibelemärit only officially opens at 6:00 a.m. and doesn’t close again until 6:00 p.m., locals stock up on their braids of onions from 4:00 a.m. As the day slowly wakes, you can stroll leisurely through the streets and admire the braids of onions in the still tranquil atmosphere. From 7:00 a.m., the lanes in the Old Town start to fill up. 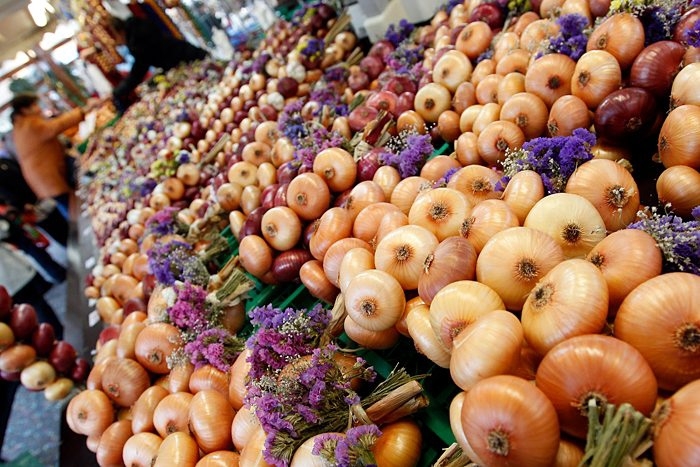 Farmers from the region bring some 50 tons of onions and garlic to the Swiss capital! Artistically braided onion braids, garlands, and figures in every conceivable design can be admired and purchased at more than 200 stalls: from giant, meter-long braids with white and red onions to arrangements with dried flowers and decorated mini-braids. It’s all about onions in the kitchens too. Whether onion tart, onion soup, onion pizza, or sausage with onions – the restaurants in Bern’s Old Town offer an array of onion-based dishes. A warming mug of Glühwein is the perfect accompaniment. If you follow the scent of caramel, you’ll also find typical market treats such as roasted almonds, “Magenbrot” cookies, and cotton candy. Most of what you’ll find at the Zibelemärit comprises onions in all forms and colors. And you shouldn’t miss the opportunity to buy a traditional, artistically plaited onion braid as a memento. However, the colored sweet onion chains are also popular souvenirs. If you’re looking for Christmas presents, you’ll also find typical market items like textiles, jewelry, ceramics, and toys. The Zibelemärit is on the list of Swiss traditions that are still followed today, officially making it one of Switzerland’s most important customs. There are many legends around the origins of the event. According to one, the first Zibelemärit was held in the 15th century as part of the Martini Market. This sold everything – except onions. And so, a separate market for onions was created. Another folk story, however, says that the Zibelemärit dates back to Bern’s great fire of 1405. When 650 wooden houses burned down and 100 people were killed, the people of Freiburg hurried to help. As a sign of their gratitude, the Bernese allowed the people of Freiburg to sell their onions in Bern every autumn from then on. A masked group known as the “Zibelegringe” meaning “Onion Heads” appears in several pubs around the Zibelemärit and tells of the events of the past year in Bern in the form of a song. As the highlight, one of the members is named the “Oberzibelegring” or “Chief Onion Head” and honored during a procession through the town, led by the “Bereitermusik Bern” brass band. The procession starts at 11:30 a.m. in the Rathausplatz (Town Hall Square). Every year since 1986, on the Sunday before the Zibelemärit, the Swiss Lifesaving Organization (SLRG) has organized the traditional “Zibeleschwümme” (“onion swim”) in the Aare river. Hundreds of stalwart Aare swimmers meet at the Schönausteg bridge, often amusingly clad in Santa’s hats or crocodile costumes, ready to swim the 350 meters to the famous Marzili. As the water temperature can be as low as 6 degrees, the onion swim is only suitable for very experienced swimmers. However, spectating is also great fun – and far warmer! From 4:00 p.m. each day, the Bern Old Town becomes a sea of color. For the young and young-at-heart, the traditional confetti battle is a great way to end the market. Whether it’s a handful of confetti or a squeaking plastic hammer that suddenly hits you on the head: the longer the day, the more convivial the mood that awaits Zibelemärit visitors. The Zibelemärit is unlike any other event in Switzerland. To enjoy the still idyllic market atmosphere in the early morning away from the crowds, you should ideally travel here by public transport. Even in the early hours of the morning, the extra trains laid on by SBB and BLS comfortably transport visitors to the Zibelemärit from every corner of Switzerland – without any traffic jams. If you’re staying in the city itself, the trams run from 5:00 a.m. The most important transport connections for early birds at a glance. The Zibelemärit fills the main and side streets of the Upper Old Town as well as the Waisenhausplatz (Orphanage Square) and Bundesplatz (Parliament Square). Tram lines 6, 7, 8, and 9 plus bus line 12 between the Zytglogge (Clock Tower) and Bern main station are therefore interrupted for the day. If you’re travelling to the main station, you can catch bus lines 10 and 19 from the Zytglogge. The line 10 stop in the direction of Köniz Schliern can be found on Bundesgasse just before the Christoffelgasse junction.